If you’re an Instagram user, then you may already know that you can reply to or mention someone by Instagram ID by using the @ symbol. To reply to me, or to make my “name” into a link within Instagram, you would type “@sandrasays.” Typically, these @ messages show up when I go to my Newsfeed tab — where I see who had liked my photos, started following me, left me a message, or mentioned me. Photos other people add of you appear on your profile under the tab. You can choose to manually or automatically include these photos on your profile. Find more info on this at http://help.instagram.com/186952328121982. 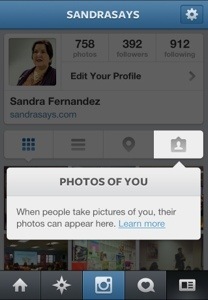 And feel free to start tagging photos you’ve already added to Instagram. Follow me on Instagram: http://instagram.com/sandrasays.